The self-managed 401(k) is the most common retirement plan provided by the majority of American employers, and IRA for low-income households who seek additional retirement planning advantages. There are over ten thousand publicly traded companies and other assets for sale, and 250+ days a year to buy them. That’s virtually, an unlimited combination of opportunities to make mistakes, stacking odds against us, and the other 75 million employees given a 401(k) plan to self-manage and direct. It’s no wonder why at least half of us have less than $25,000 in the 401(k) account. Meanwhile, this single plan is the primary retirement account most Americans have. Against the odds, there have been success stories for long term investors. Coca Cola’s price achieved 21X growth over 12 years (29% annual ROI) starting around 1986. Apple’s price achieved 58X growth over 10 years (50% annual ROI) starting around 2003. Microsoft’s price achieved 55X growth over 9 years (55% annual ROI) starting around 1991. But those deals were for people who were working at least a minimum wage job decades ago. Find similar strong price movements today and learn how to backtest stock market screens and filters. pH14 Plan reviews strategies to find strong price movements, build and backtest stock market filters and screens, and setup nightly emailed alerts for when historical patterns re-appear. and with decreased draw downs. Members have access to variations of the coding scripts we have constructed, with video instructions on the strategy behind the coding scripts. 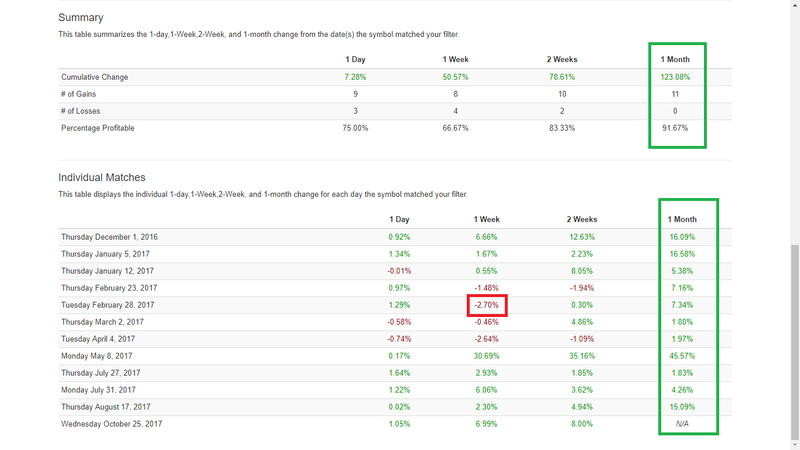 The pH14 Plan strategy 1) identified a short list of 4-5 prices to watch, and 2) we backtested various entry strategies to achieve 30%+ gains within a month, with minimal drawdowns, and 100% of the alerts had ‘gains’ by the end of the first month. Register on the website. 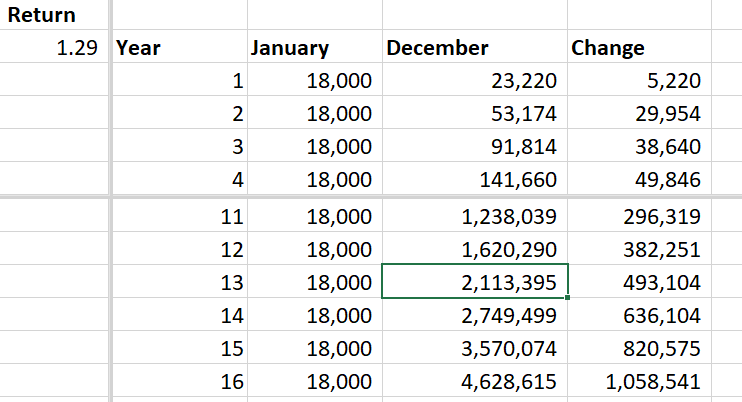 Critique this approach to the 401k. Backtest it yourself. The model isn’t perfect – continue making improvements to achieve desired results in years to come. Active members have access to the underlying code for the filter. In the past year, 100% of the 5 results of this single filter, have been profitable within 1 month. A set of alerts in May, and a couple in Sept.
Max draw down reported at -0.17%. Median gains within a month, > 30%. Obviously past performance isn’t indicative of future results. You can lose all your money in the stock market. Our investment objective may not be your objectives. See other conditions. But we’re delighted to see that there may be methodologies and strategies to help manage the inherent risk associated with investing for retirement. Don’t want to see so many alerts? No problem. We’ve constructed filters and screens that display less frequently in the past year. Active members have access to the underlying code for this filter. In the past year, this filter displayed an alert only twice, and both produced gains over 20% within a month, with negligible drawdowns. One in April, another in August. What if you wanted to see potentially a higher volume of alerts throughout the year, here are the results of a 3rd filter we built. Max draw down of 2.7%. Highest 1 month ROI of 45%. Members have access to the script. Active members have access to the underlying code and broader strategy that produces each of the filter results displayed in this post. When you want to bake a cake, you don’t just start randomly throwing around flour, milk, eggs, and sugar (aka, your money), and just toss it in a hot oven (aka, the markets)… Instead, you start with a recipe, and one that’s been tested (“backtested”) recently. pH14 Plan has a recipe. Learn it. Practice it, in a no risk simulated environment with fake money. But don’t stop there. Improve upon our recipe, per your own preferences for ‘taste and flavor’. Previous Previous post: Can the President Affect the Stock Market?